The Thompson Tide: It's Torrey Time! It's time for the ThompsonTide guys' favorite PGA Tour stop of the year: the Farmers Insurance Open at Torrey Pines! The PGA Tour, with Michael Thompson in tow, has made its yearly stop in San Diego and we can't wait to watch Michael in person. The FIO at Torrey Pines takes advantage of both the north and south courses along cliffs overlooking the Pacific Ocean. The north course is fairly short and easy by PGA Tour standards with the south course, the host of the 2008 US Open, is yearly one of the longest and most difficult courses on tour. 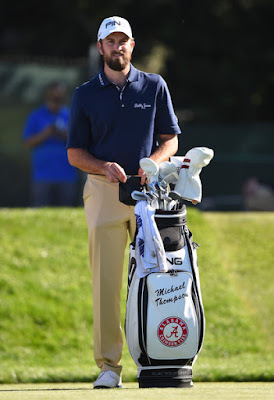 Michael gets his tournament under way on the north course teeing off from the tenth hole at 10:10am PT. He is grouped with George McNeil and Johnson Wagner. I will be on site an will attempt to provide live updates via Twitter. Watch the right hand twitter feed window on this page or follow us on Twitter (@ThompsonTide) for updates.